One man’s trash is another man’s treasure, the saying goes. 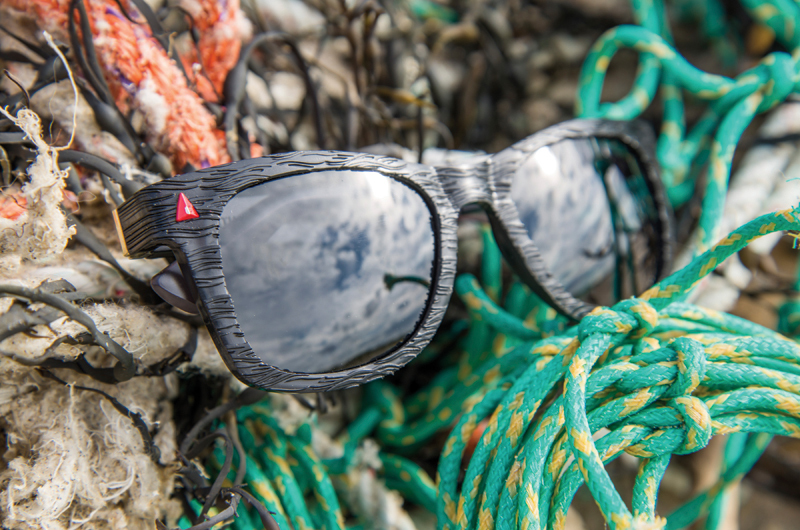 Founder Rob Ianelli and partner Ryan Schoenike are taking the world’s plastic trash from the ocean and turning it into a treasure for all: seventies-style sunglasses. The new line from this one-year-old company, Norton Point, is called Sea Plastic Differently and debuted on World Oceans Day in June. Five percent of the profits will go to global cleanup, education, and remediation efforts. As with Norton Point’s previous line of glasses, which were made of cellulose acetate, another 1 percent of the profits will go to The Trustees of Reservations. Picking the Trustees as a beneficiary was no mistake. Not only does the organization line up with Ianelli’s mission of sustainability, but it has a long history in his personal memory. Now a year-round resident of the Island, he grew up summering in Edgartown and envied the Trustees employees zipping around the beach on ATVs. “That was my dream job when I was eight,” he said, leaning back against a bench in Edgartown. Dreams change, however, and the thirty year old has realized a different one: designing sunglasses. He’s been in the industry for more than eight years. After graduating from American University, Ianelli designed a pair of glasses that could open a bottle and puncture a can for shotgunning a beer. He called his creation Brewsees and formed a company of the same name to produce them. Brewsees are a line of sunglasses worthy of a fraternity house, but Ianelli was never a brother – he just knows a market when he sees one. After the success of Brewsees he knew he wanted to have a brand inspired by the Vineyard, but had been waiting for the stroke of inspiration. “I kick myself, because for almost a decade I’ve been standing on this beach where I like to spend most of my time and that was the brand name I’ve been waiting for,” he said. An avid sailor and fisherman, Ianelli had heard about the vast amount of plastic in the ocean and seen trash wash up on the coastline, but a trip to Haiti opened his eyes even wider. “The whole country is just covered in plastic,” he said. Haiti is where Norton Point gets the recycled, high-density polyethylene used in the new line of glasses, from an organization called The Plastic Bank that buys plastic collected from the canals and streambeds by otherwise unemployed Haitians. The glasses use stainless steel hardware and are wrapped in recycled paper packaging. Ianelli hopes Norton Point will become a zero-waste company. But not zero promotion: this summer he arranged for the Edgartown Launch drivers shuttling people to yachts in the harbor to wear the glasses, while the outdoor staff at the Harbor View Hotel were decked from head to toe in Norton Point clothing and shades. The product line is available for sale at Island retailers, including Summer Shades and the Green Room. Will sunglasses save the ocean? Probably not. But Ianelli hopes his success will encourage other businesses to look for environmentally sound ways to operate. “Innovate around the waste,” he likes to say. After all, what other treasures might be lurking in the trash?